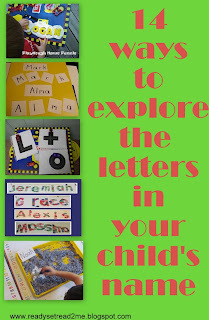 Earlier this week, I featured some wonderful ways for preschoolers to learn letters. Often those first letters that a child can identify are the letters in his or her own name. Soon the child begins to visually contrast those letters that they know with letters that they do not know. This visual comparison can be aided by using magnetic letters and contrasting letters by distinctive features (curves, lines, slants, etc.). Eventually, the child learns to correctly identify each letter. As the child is learning to visually identify letters, they are also beginning to associate some of them with a sound. Educational psychologist Marie Clay said that a letter is "known" when a child can identify it by name, sound, or a word that begins with the letter sound. I think she defined these letters as known because she wanted teachers to push children to begin using these known or partial known letters with in the context of reading or writing. Learning beginning letter sound can occur while you are reading interesting and fun texts to your child. Some of our favorite books are Dr. Seuss books. Since his birthday is coming soon, I'll use his books as examples. If you are reading "Green eggs and Ham", you could mention the word "ham" to your child. "What letter would you expect to see at the beginning of the word, 'ham'?" Let your child guess and check. If they get it correct, you can look for other "h" words in the story, like "house". This will work in any book, with any letter! You may also choose to teach beginning letter sounds with a more direct approach. Alphabet books can be wonderful for this practice and there are tons of wonderful alphabet books. Dr. Seuss even has a fun alphabet book, Dr. Seuss, ABC. We've enjoyed reading this book this week along with 3 Dinosaurs accompanying movement activities. A third way to reinforce the principal of learning letters and sounds is to give children letter books that focus on beginning letter sounds. 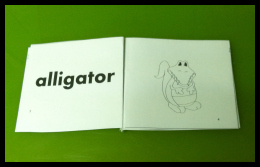 I have created printable books for emergent readers, Alphabet Books. 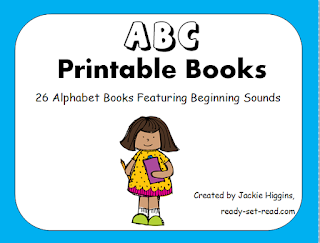 The Alphabet Book pack includes 26 mini-books that feature each letter of the alphabet. Each book includes the focus letter on the cover page and words and pictures that begin with that letter sound. These alphabet books will print in black and white. These books are designed to be cut and folded in order to form little books. The little books include a single word on the left page and a single, clear picture on the right page of the book. These books are wonderful for helping students to firm up the skill of moving from left to right in text. Instructions for how to assemble the books are included in the download. You can purchase these in my Teachers Pay Teachers Store! 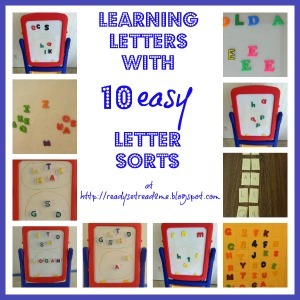 For more ideas, check out my Learning Letters Pinterest board! What a great idea to explore the alphabet and phonics using the letters of your child's name. They would LOVE that!